Depletion of ground water leading to social conflicts and migration. Emphasis must be placed on collective action to reduce consumption and regulation of access. 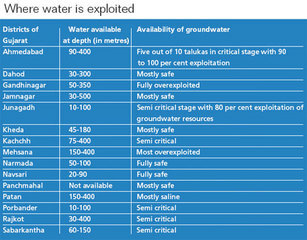 Groundwater scarcity due to aquifer depletion is an increasing problem in peninsular India leading to well failure, falling water tale and saline water intrusion. For more than 20 years Gujarat has been at the forefront of debates concerning water scarcity and a declining groundwater table. Water for drinking and irrigation is of critical concern, particularly in low rainfall and groundwater recharge areas. In Gujarat's Mehsana district, groundwater pricing inequity between members of well organisations and non-members has lead to conflict. The potential for group-owned well organisations to profit from water sales has resulted in unlimited and unsustainable groundwater extraction. Similarly, in "Water Conflicts in India: A Million Revolts in the Making", researchers Anjal Prakash and R. K. Sama noted a well and pipeline project that attempted to meet the drinking water needs of poor landless villagers in Surendranagar district exposed the challenging internal dynamics of the community. Landed farmers opposed the well, fearing a smaller share of the aquifer. “It highlighted the fact that power structure and social and economic hierarchy go hand I hand and unless the issue of resource inequity is tackled through policy and advocacy, the real issue will not be solved,” Prakash and Sama said. A 2013 study found the incidence of poverty was significantly higher where groundwater irrigation required more capital-intensive submersible pumps, while conflicts over irrigation water greatly increased in these villages. Researcher Avinash Kishore notes the situation is more dire in water scarce regions such as the Mehsana district in North Gujarat. "Here, aquifers are so depleted that digging deeper wells and installing more powerful pumps does not allow to access more water. Often even deep wells have low and unreliable discharge, brackish water and a high rate of failure. 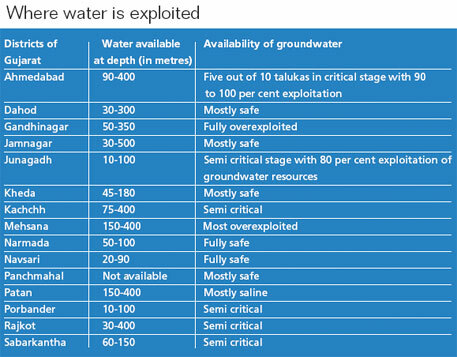 While groundwater scarcity is found in large areas of India, pockets like Mehsana represent the more advanced stages of depletion." Kishore found groundwater depletion was also causing displacement as farmers and laborers migrated to cities. Young men are leaving for large cities at higher rates, while those staying behind in more water scarce villages shifting to non-farm occupations. One Gujarat sarpanch (village head) told him “Young men have all moved to Ahmedabad now. You will not find anyone here. What will they do here? There is no water.”  While geo-hydrological factors could be identified as important constraints in the availability of water in parts of the state, the crisis can be attributed to sheer mismanagement of the sources: neglect of groundwater recharge efforts; rationalisation and control of water use by competing sectors (especially, those diverting water for unbridled commercial uses); and lack of initiative in rejuvenating and enhancing the capacity of water sources through scientific intervention, including that of numerous traditional water harvesting systems. Given the major crisis in water management, ensuring an adequate supply of ‘safe’ potable water on a regular basis, especially in the arid and semi-arid zones, is a serious challenge. Age-old caste-based conflicts can also flare when water resources are stretched. In fact, in both the social and political arena, inadequate water supply continues to evoke strong responses such as ‘water riots’ during drought years. In February 2015 women protesting lack of access to safe drinking water were "lathi-charged" (beaten with sticks) by police, resulting in several women, some in their 50s and 60s, being hospitalized , while in 2001 eight people were injured when police stepped in to stop them from self-immolating and about 5000 people were fired on when they pelted stones at police . Water contractors were being promoted by Rajkot municipal authority, which was only able to supply water three days per week, further depleting groundwater. The field is ripe for more frequent conflicts over dwindling water resources and contending needs into the future. McKay, Jennifer., and Diwakara, H. 'Groundwater irrigation in Northern Gujarat: Digging deep for answers', Water conflicts in India: A million revolts in the making, 2007. Das, Keshab. 'The sector reform process in rural drinking water and sanitation: A review of the role of WASMO in Gujarat', Reform initiatives in domestic water and sanitation in India, Forum for Policy Dialogue on Water Conflicts in India, 2015. Prakash, Anjal., and Sama, R. K. 'Social undercurrents in a Gujarat village: Irrigation for the rich versus drinking water for the poor', Water conflicts in India: A million revolts in the making, 2007.